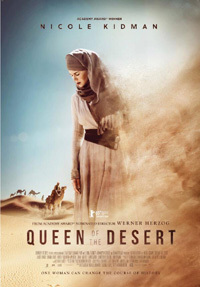 Set around the period of the 1st World War and 12 years leading up to it, this adventurous Middle Eastern desert setting of the early 1900s was directed by brilliant German auteur Werner Herzog, and is in fact a biographical account of Gertrude Bell - a woman who had great influence in the structuring of that region, a woman I never knew existed. While not exactly historically accurate to a fault, Herzog rectifies historic omission by bringing us this fascinating look at her life. More than a traveler, writer, archaeologist and political attaché for the British Empire, her influence decided borders. Bell was an intelligent woman with passion beyond English high society. To get away from the artificiality of her surroundings with which she couldn't identify, her father arranged for her to go to Tehran where her uncle was an ambassador. She meets a young secretary working for her uncle, falls in love, marries, but her destiny reaches further, rekindled by tragedy and heartbreak. She travelled across the desert, earned the respect of the Bedouin, explored Petra and befriended T.E. Lawrence (immortalized in David Lean's Lawrence Of Arabia). This mysterious, desolate but beautiful arid land becomes her passion. While not respected amoung military high ranks, the indigenous rulers do. The Ottoman empire's 5000 year rule was coming to an end in the Middle East with quarreling factions, Bell becoming a pivotal diplomat. The theme of Westerners in exotic places is one very familiar to Herzog, his collaborations with Klaus Kinski still resonating (from Fitzcaraldo to Aguirre: The Wrath Of God). While reminiscent of movies like Sheltering Sky and maybe even White Mischief, at first I wasn't really titillated to see this film, until I saw Herzog was at the helm.